Are you following the Zone Diet? That’s great! That said, do you know the top Zone Diet protein sources that you can choose for your overall health and to achieve your weight loss goals? 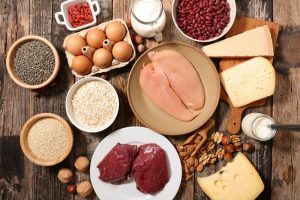 Keep reading for a list of five Zone Diet protein sources you can easily incorporate into your daily meals. The great thing about the Zone Diet is that you can add plenty of plant-based protein sources to your meals. A good example is soy, which is high in protein and myriad other nutrients for overall health. Another protein source would be skinless chicken, which is a lean option that is also versatile enough to include in a variety of dishes that you can prepare at home. Adding nuts to your meals or having them as a snack is another way to get the protein that you need in your diet. Plus, nuts are also packed with various vitamins and minerals, as well as healthy fats for optimal wellness. Another lean protein source that you can incorporate into your Zone Diet meal plan is turkey. Finally, you can also use fish as a protein source while following the Zone Diet. Just keep in mind that a lot of fish are now contaminated with high amounts of heavy metals like mercury, so do your research and shop carefully. As you can see, there are a lot of different categories for the protein sources that you can use when it comes to following the Zone Diet. Don’t feel as though you have to restrict yourself, as there are so many options to choose from. Instead, keep things interesting so that you won’t get bored of the foods that you’re eating every week. With these Zone Diet protein sources, you can create a variety of delicious and nutritious meals right at home. Those meals will help you stay on track as you work hard at losing weight and getting in shape, and you won’t feel deprived along the way.